Our new family addition finally made her debut on Saturday October 15 at 8:43pm, weighing 6lb 11oz. Her arrival was quite traumatic, but she is healthy, so I couldn't ask for more! It was traumatic. Very traumatic and not how I wanted it to go at all. The midwife came over on Sat morning, I drank castor oil, did 2 hrs of breast pump stimulation, liquid herbs to stimulate my uterus, then opted for another stretch and sweep (horrible procedure, but the first one hadn't done much that was done on Wednesday). As soon as the stretch was done and midwife left (around noonish) my contractions started. She came back around 3 or so and things were really going. I was having very regular, close together contractions over a couple of hours it was whoa, intense, but I was handling it. The midwife thought I was getting toward the end and then I decided to stay at home and try to deliver her at home with laughing gas. Well my water broke and other things passed through...whoa, castor oil works well. Yuck. Not long after little plops of poo came out, but not mine. Midwife checked me I was 4cm dilated and, surprise (! ), the baby was suddenly breech! All the midwives had said she was head down and engaged up to this point.Hospital, stat! The drive was agony. We were behind someone going 15 under the speed limit and I had went from 4 to 9.5cm dilated by the time we got there (20 min!!!). They hooked me to an ultrasound and determined, yes, she was frank breech. We had to wait for the on call surgeon and anesthetic person. I got a spinal block, but it didn't take (they tested 4 times and my belly didn't go numb!! ), so they realized I needed to be put under, so Michael was made to leave, I got gas and drugs in my IV and was put under. She was delivered at 8:43pm. Michael later told me it was 4 min from him leaving the OR to her crying. I saw her another 40 min after that. I feel like I've been run over and beaten from the inside out. A c-section is no joke. I don't know how or why people actually opt for this. Vaginal birth would have been so much easier. But she's here now and couldn't be any healthier, so I'm very thankful for that. She was never under any stress during all of that trauma to me. Praise God for bringing us through a difficult delivery. First, let me say congratulations to you and Mike - she is beautiful!! Secondly, woah! That's a rough delivery!! I'm so sorry you had such a traumatic experience. How are you handling the recovery? PS Don't know why I called him Mike when he's clearly Michael in every one of your posts! Sorry, Michael!! Thanks Liz! Sorry for the delay. I'm not getting online all that much. Recovery was really, really rough at the beginning. Everything on me hurt, everything...even chewing and swallowing. Getting in and out of bed, going to bathroom, forget about it! 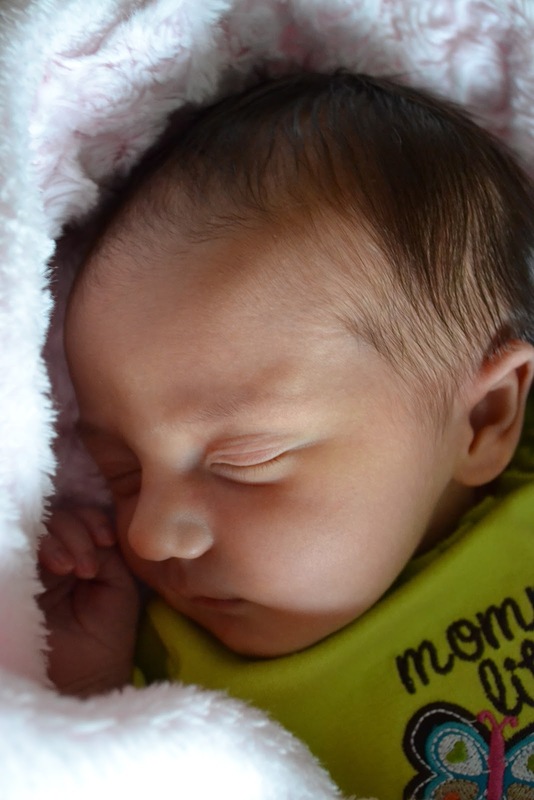 I'm doing MUCH better now and Paisley is a great little babe, so I couldn't ask for more!